A special Speed Awareness Seminar was held at the town hall earlier this week for drivers caught speeding in a recent traffic enforcement operation between Merseyside Police and St Helens Council’s Road Safety team. The operation was carried out on roads across St Helens during National Road Safety Week by members of the Merseyside Road Safety Partnership, which includes councils across the region, Merseyside Police, Merseyside Fire and Rescue, Merseytravel and Highways England. 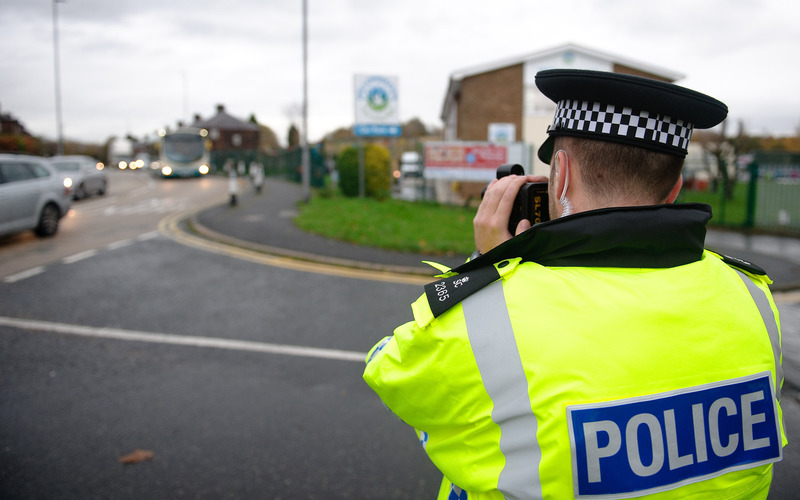 During the operation – attended by Merseyside’s Police and Crime Commissioner Jane Kennedy – police officers used speed radar guns to check drivers were adhering to the 30mph speed limit and stop those who weren’t. They also stopped drivers using mobile phones and anyone observed not wearing seat belts. 30 drivers were caught excessively speeding and handed traffic offence reports, while 80 caught at lower speeds (up to and including 35mph) were given the option of attending the Speed Awareness Seminar, instead of the report and the fines incurred. The interactive seminar was designed as a cautionary experience, with speakers including St Helens Local Policing Chief Inspector Steve Brizell and Constable Neil McEwan; George Houghton, St Helens Council’s Head of Traffic and Road Safety; David Midmer of national charity RoadPeace, and local approved driving instructor Laith Chapman. Speakers covered road safety topics from the perspectives of enforcement, engineering and education. Concluding the seminar, Rebecca and Glenn Youens – the parents of Violet-Grace who was tragically killed by a speeding car earlier this year – made an emotional plea for motorists to drive safely, highlighting the devastating impact such carelessness by drivers can have, and sharing their harrowing ordeal. Rebecca said: “We would like to thank Merseyside Police and St Helens Council for giving us the opportunity to tell Violet’s Story, and hopefully change perspectives on speeding. Even a few miles per hour over the limit, can make a huge difference to whether there is a casualty, or a death. We would like people to sit back and think about their driving, and what impact that can have on other people. “Drivers are not the only people on the road, and it’s sometimes just thinking outside the box. We are facing the devastating fact that Christmas is around the corner, and we will never get to spend it with Violet again. We should have a very excited little girl, telling us “I’m on the good list, mummy and daddy”. Violet should be playing with her little brother, and we should see the special bond they have grow and develop. They both should be excited on Christmas Eve, probably too excited to sleep, because Santa is coming. Waking up on Christmas morning together to check the mince pie, and carrot have been eaten, then opening their presents and playing together all day. “Instead, our daughter has been killed by a speeding driver, and our poor son doesn’t understand where his big sister, and best friend has gone. We have to try and be positive for our son, even though our hearts are broken inside. Hopefully, by telling Violet’s Story, she will go on to save more lives. We miss our beautiful, sweet and kind daughter, every single minute, of every day; the pain is unbearable. Rebecca also touched on how Violet-Grace went on to save two lives after her death through organ donation. Attendees were given packs to take home, containing information from all the partnership agencies and a free copy of the Highway Code, which many drivers don’t review after passing their test. Chief Inspector Steve Brizell said: “The death of Violet-Grace was an avoidable tragedy and the devastating impact of this incident and all serious collisions is deeply felt by family, friends and the wider community. An event like this allows Merseyside Police and our partners to highlight the consequences of driving at excess speeds, both for the victims and the drivers themselves. Councillor Terry Shields, St Helens Council’s Cabinet Member for Green, Smart and Sustainable Borough, with responsibility for road safety, said: “Every death or serious injury on the roads of our borough is one too many. The death of Violet-Grace is a tragedy still fresh in our memory as a community and I’m certain that nobody wishes to see a day like that again.